In March 2012, soon after my March 5 birthday – age 56, I began to experience what looked like gashes of lightning floating within my field of vision, for a few minutes up to an hour per attack. The first attack came while I was at a grocery store, making it difficult to see products on the shelves and read the labels. It lasted about 15 minutes. I put on my sunglasses to reduce discomfort of light. Doing so reduced the discomfort from the attack, and probably increased speed of recovery. I don’t know what caused that attack. I don’t know for certain the cause or causes of the same kind of attack several times since then. …All of mine have been bright white, sometimes slightly bluish, as well as jagged like fragments of glass with straight lines and angles per fragment, but curving around like in the above image. It reminds me of the after-image when looking directly at a flash of light, especially a flash of lightning. Perhaps also comparable to a strobe light effect. The disturbance itself sometimes resembles a flash of lightning but frozen in time or like captured with a still camera for a photograph. It is as visible with eyes closed as with eyes open. It tends to drift slightly to one side of my field of vision. The lengths of the bolts have varied – start out small and looking kind of like the letter C, and then grow in length as well as width into shapes like combining the letters of C, J, and S or Z with the ends connected. Sometimes the bolts have resembled a snake-like dragon with wings. I also describe some of them as being like gashes in my field of vision, with blinding light coming through from the other side – whatever the other side might be – almost like seeing a rip in the space-time continuum. A few times I thought I could barely see the details of something on the other side, kind of like a Google Earth image looking down at the ground from high up – like looking at a jagged slice ripped out of a map. I though it might be some kind of attack within the brain, rather then being limited to just being a visual disturbance – limited to eyes – as a cause within eyes instead of within the brain. Only one time I saw something similar when the result was deliberate. It was while I was getting an EEG with the wires hooked to my head. “An electroencephalogram is a test that detects electrical activity in your brain using small, flat metal discs (electrodes) attached to your scalp. Your brain cells communicate via electrical impulses and are active all the time, even when you’re asleep.” All of my attacks have been during the daytime, and usually late mornings. During the EEG I saw various patterns of light and like flashes of lightning. The technician remarked to the doctor, “He has well developed pathways and patterns of thought.” The EEG did not detect anything wrong. I had requested the EEG because of unusual headaches, which turned out to sometimes be migraine headaches, and sometimes caused by my fluctuating hypoglycemia – low blood glucose, The brain cells use glucose for fuel. Rarely I fluctuate into hyperglycemia – high blood glucose. There is depression with low glucose and slightly manic with high glucose as physical causes of those mood swings. More depressive than manic is Bipolar II. Contributing to that is iron deficiency anemia, and anemia from occasional bleeding stomach ulcers, resulting in less oxygen reaching cells. I looked up the visual disturbance symptom on the Internet – doing a Google search with several related descriptive key words. I found it to be a symptom of “Ocular Migraines” associated with Migraine Headaches. It has been determined in some cases to happen before migraine headaches, so if you get an ocular migraine then it will soon be followed by a migraine headache. Kind of like an early warning system, giving me a chance to take steps to try to prevent the migraine headache with medicine or modification to beverages and food intake relating to blood glucose. I discovered MSGs – monosodium glucamate – in foods will consistently trigger my migraine headaches, so I’ve tried to avoid foods with MSGs noted in the listed ingredients. 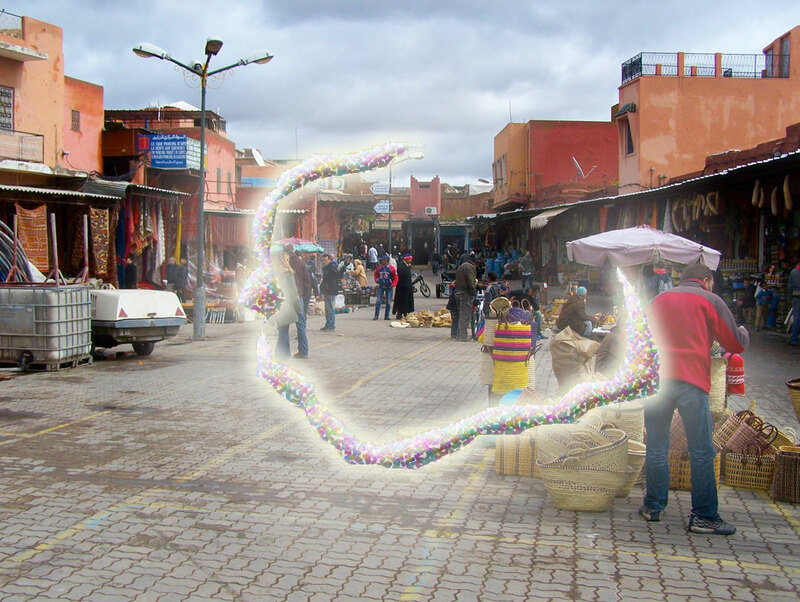 “Scintillating scotoma” comes from “Cortical spreading depression” and there is an animation image at http://en.wikipedia.org/wiki/Cortical_spreading_depression showing what happens. 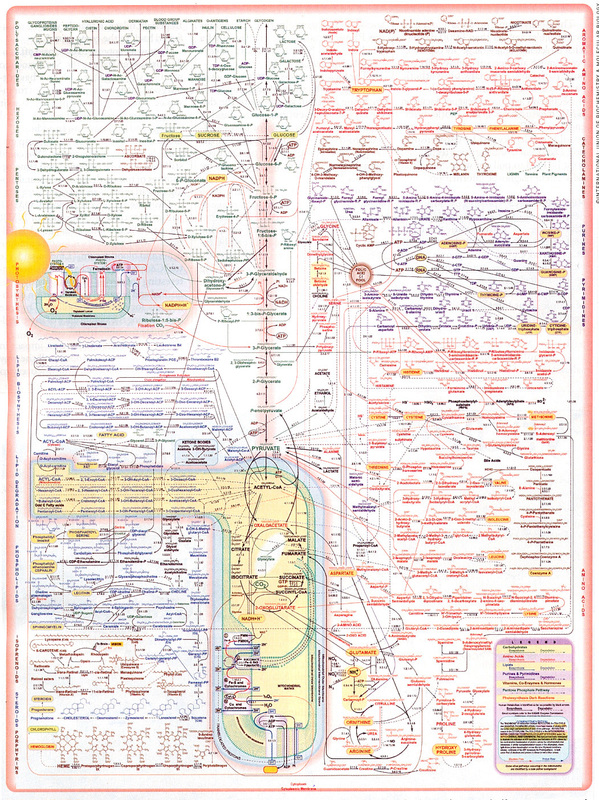 Map of Metabolism – click on image to see full size. Oxidants in air, food, water and other beverages, including pollution, damage RNA in cells, then that damage is carried from generation to generation by DNA. The RNA damage causes metabolism to malfunction, which in turn results in most physical disorders, such as those reported here. I’m caused to wonder if the symptom, scintillating scotoma with a bilateral arc image in field of vision, has been greatly misdiagnosed in the past as some kind of psychotic delusional disorder – seeing “things” that are really not there. I believe there is a difference between emotional illness and mental illness. Most emotional illnesses are wrongfully classified as mental illness, while mental illness itself is not correctly defined. I believe true mental illness is caused by an electro-chemical disorder in metabolism, which prevents the brain from functioning correctly. In other words, mental illness has a physical cause. It can be fixed. There can be prevention. There can be a cure. It need not be endless treatment by a psychologist who conveniently claims there is no cure to justify endless treatment to keep the money coming in. A good MD can fix it. Even better wold be a nutritionist. I suspect most cures – or at least low cost and more effective treatments – can be found on grocery store shelves – the right beverages and food – so the brain gets the right kind of fuel to function correctly. Minerals and vitamins too of course. I agree with Mike Huckabee that we need to shift back to “a prevention and cure health care system” and put an end [as much as possible] to the much more expensive endless treatment system. As is, it’s an evil greedy vulture culture system, which puts money first, and health care last – if any at all.